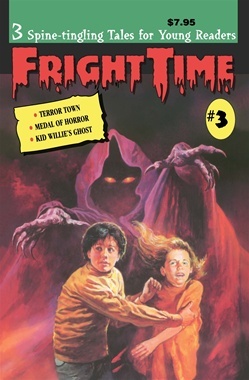 When Matt took on his older brother's early morning paper route, he didn't know that the early morning hours held his worst nightmare, and that he was living in TERROR TOWN, where his neighbors are becoming monsters. Eric and his younger brother, Ben, like to swim in the pond near their new home, but neither will win anything but a MEDAL OF HORROR after someone nearly drowns and Ben feels himself being pulled under the water by a boy only he can see. A haunted house is one thing, but who ever heard of a haunted ball park inhabited by a not-so-friendly ghost? In KID WILLIE'S GHOST, the only person who can help Jeff survive the menace is a ballplayer who disappeared twenty years ago.